"If a pilot is using radar services, do they need a clearance through classes B, C and D airspace or it that established with a code?" - Charley V.
"This is a question of airspace hierarchy – and B trumps C; C trumps D etc. When you're looking at charts and trying to determine airspace you'll be flying through, be careful because the chart may be difficult to read in a congested area. For example a Class D is normally up to 2,500 feet AGL, but a lower B or C floor above it will be delegated to the facility controlling the higher level airspace. So review your charts carefully. 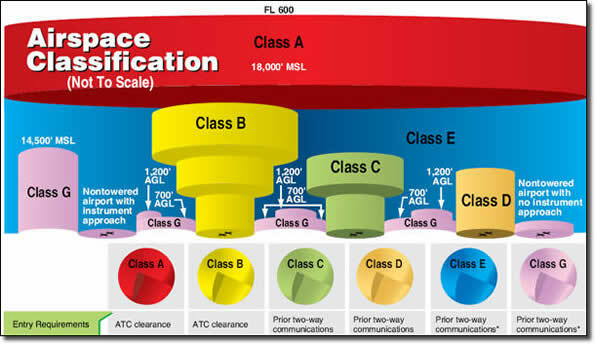 A separate and specific clearance is always required for Class B airspace. Even if you are receiving advisories from the Class B controller outside the B, it does not constitute a Class B clearance. Class C and D airspace do not require a separate clearance. If you are in two way communications with the controlling facility or the parent approach control, you satisfy the requirements for authorization through a Class C surface area. The approach controller providing Class C service must coordinate with any Class D surface areas or issue you specific instructions to avoid the D.
The Controller's handbook specifies that a pilot is not expected to obtain their own clearance through a Class C or D while obtaining advisories."